Deir Istyia, Occupied Palestine – Deir Istyia, in Salfit district, is a village of 4000 inhabitants who mostly live on agriculture. The Salfit district has 19 villages and 24 settlements. Land confiscation is ongoing in the area and many of the settlements are growing, as the road that connects them is widening. The 3 families are now the only Palestinians living on the west side of the road. Now three families, living in the outskirts of Deir Istyia (see photo), are under daily threats and harassment from the Israeli forces. They don’t know if the goal is to take over their land or just to try to make their lives so unbearable that they will themselves decide to move from the land on which they have been living peacefully for many generations. It started in the beginning of October this year, where the soldiers started to come to the houses and harass the families, mainly at daytime. Often the women are alone with the children during the day while the men are working. Israeli forces have chosen this time to come to the houses and scare the families. One of the women explained to us that the soldiers hit her, told her that the house wasn’t hers and that she soon would have to move away. They also told her that she was a terrorist, and that the soldiers would soon come back and shoot her. Over the last 4 days the Israeli forces have been there day and night, telling the families that they have permission to stay on the roof of one of the houses. One night, they stayed all night and slept on the roof. They claim to have to watch the road and the surroundings, because of stone throwers, even though there hasn’t been any stone throwing in that area. Last Saturday, when the soldiers were there, they took pictures of the house and the yard. Now, the children are very insecure, and their mothers don’t leave the houses as they are afraid of leaving them alone, a situation that makes them feel, as they describe it, as in prison. They can hear the soldiers walking around outside their houses and standing on the olive hill behind them at night. Volunteers from International Solidarity Movement and International Women’s Peace Service will follow up on the situation of these families. Occupied Palestine – Kayla Mueller volunteered with the International Solidarity Movement from August to September of 2010. Ramallah, Occupied Palestine – Today during a protest at Qalandia checkpoint, an Italian ISM volunteer was shot in the head with a rubber-coated steel bullet. The injury is just two centimetres above her left eye. At least one other Palestinian teen was hospitalized after being shot with a rubber-coated steel bullet. Giulia was immediately transferred to Ramallah Hospital for medical treatment, requiring stitches for her injury. Approximately 100 people attended the demonstration, where Israeli forces fired stun grenades, tear gas canisters, and rubber-coated steel bullets. The protest was called today to commemorate the 97th anniversary of the Balfour Declaration. Gaza, Occupied Palestine – Hospital staff and international activists, from the U.S., Sweden, and the UK, attempted to travel to the recently bombed el-Wafa hospital, in an attempt to retrieve salvageable medical supplies. When they arrived at the hospital it was, “still smoking from the attack this morning.” Stated U.S. International Solidarity Movement (ISM) activist, Joe Catron. The staff and activists were forced to retreat. Previous attempts by the Red Crescent to enter the Shajaiya neighbourhood to retrieve wounded people from this area were met with live ammunition from the Israeli army. El-Wafa hospital is just outside of Shajaiya. On July 17th, the Israeli military fired rockets and shelled the hospital, forcing patients to be evacuated to Al Sahaba medical complex. The embassies of the international activists were informed by the ISM, and asked to do everything in their power to fulfill their responsibility to ensure that Israel respects international law and does not target this delegation of Palestinian and international human rights defenders. The staff and internationals may try to retrieve supplies again, for now it was impossible. Salfit, Occupied Palestine – Two educational institutions were attacked with tear gas and stun grenades by the Israeli army yesterday morning in Salfit. At least ten female students required medical attention after suffering from excessive tear gas inhalation. 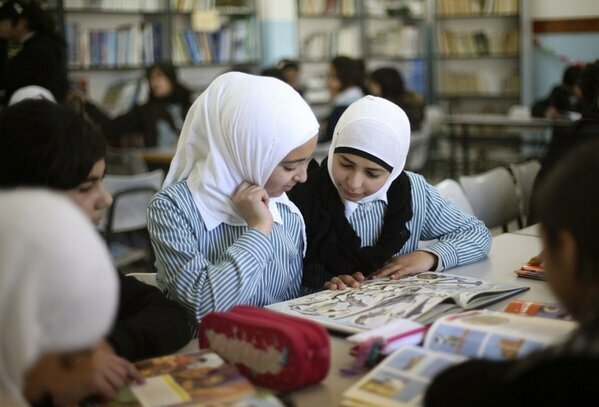 At 12:30 yesterday afternoon, Salfit’s female elementary school was empty. Only a few staff remained, attempting to clean the walls after Israeli soldiers threw tear gas and stun grenades in an attack earlier in the morning. According to the headmistress of the school, the attack took place at approximately 9:30 am. At this time, the classrooms were full of female students between the ages of six and 12-years-old. The soldiers shot the tear gas from the street and it landed in the playground, school corridors and on the roof, with the tear gas itself drifting into the classrooms. Staff from the school reported that ten young students required medical attention on site; two of them temporarily lost consciousness due to the inhalation of tear gas. When the headmistress was reassured that the Israeli army had left Salfit, at approximately 11:30 am, she began evacuating the girls. Both the school psychologist and headmistress agree that the girls were in shock, many of them crying when the attack began and after were afraid of leaving the school by themselves. The girls were planning for tomorrows’ Childrens’ Day celebration, which has been delayed until next Thursday because of the attack. The school psychologist expects that at least half of the students will not attend the following day after this experience from the Israeli army. A female secondary school is located just meters away from the elementary school. Fortunately, no one was injured in that institution despite some exposure to the gas, but it did eventually close early as a precaution. Witnesses reported that Israeli forces have also harassed neighbours to the school who photographed the attack. That is the case with Ahmed Zubuydi, aged 21. He was working in a nearby shop when a military jeep stopped in front of him and interrogated him for 20 minutes. He was asked to show his ID and was thoroughly searched. The commander of the Israeli soldiers began asking personal questions, such as where Ahmed worked, where he studied, and where he spends the money he earns. Ahmed reports that this is not the first time he has been interrogated by the Israeli army. The headmistress of the girl’s elementary school reported that this is the second time this year that this sort of attack has occurred, with the first taking place in January. The school fears that these attacks may become systematic and will therefore seek training from the Fire Department to help cope with future incidents. Ramallah, Occupied Palestine – This afternoon approximately 500 Palestinian, international and Israeli demonstrators gathered close to Ofer Prison in Ramallah to protest against the refusal of the Israeli state to release the fourth group of Palestinian prisoners. As part of the current round of talks between Fatah (the Palestinian government of the West Bank) and the Israeli government, a series of prisoner releases was promised by the state of Israel, and the fourth was due to be carried out by the end of March, the Israeli government has now refused to honor the final release. The demonstration began at approximately 12pm, the protests’ aim was to march towards Ofer prison itself, but due to the large number of Israeli forces present, this was not possible. The demonstrators also twice attempted a prayer at the start of the protest, but were unable to due to the high level of aggression from Israeli forces. As the demonstration was beginning a 53-year-old Palestinian was shot at several times through the window of his car as he was driving away from Israeli forces. One of these rubber-coated steel bullets struck him in the head. The rubber-coated steel bullet broke several bones around his eye, a piece of the bullet was unable to be immediately removed and so he required surgery. The level of violence escalated from this point as Palestinian youth threw stones at the Israeli military, while they (the military) fired hundreds of tear gas canisters, rubber-coated steel bullets and live ammunition, injuring many demonstrators. At several points during the demonstration, Israeli forces fired tear gas canisters directly at protesters, both highly dangerous and in contravention to Israeli military procedure, which is shooting them up into an arch to lower the impacted velocity. 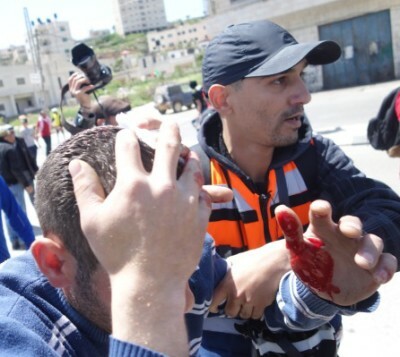 A full list of all those injured is currently not available, however at least 10 people were transferred by ambulance to a local hospital in Ramallah to seek medical treatment for their injuries and Red Crescent medics at the demonstration treated many others for varying wounds. A 21-year-old Palestinian activist was injured after being shot from extremely close range with a sponge-tipped projectile in the back. Two ISM activists were also both shot from extremely close range with sponge-tipped projectiles in their backs. A 20-year-old Palestinian was shot with a rubber-coated steel bullet in the head. A 48-year-old Palestinian journalist was shot with a rubber-coated steel bullet in the left shoulder. A Palestinian activist was shot with a rubber-coated steel bullet in the foot. A 20-year-old Palestinian was shot with two .22 live ammunition bullets in his foot and in his knee. A 30-year-old Palestinian was shot with .22 live ammunition in his right hand. Another Palestinian was shot with .22 live ammunition in his left foot; the bullet was unable to be removed. 36-years-old Palestinian was shot with two .22 live ammunition bullets, both in his left foot. A 31-year-old Palestinian was shot in the left leg with .22 live ammunition. A 36-year-old Palestinian was shot with .22 live ammunition in the left foot. Mohammed Yasin, a photojournalist from Bi’lin who was wearing a press vest, was shot in his face with a rubber-coated steel bullet and also shot in his stomach with a .22 live ammunition bullet. He remains in hospital in serious condition, as the bullet may have destroyed parts of his liver. Bruqin, Occupied Palestine – On the 1st of April, at approximately 5.30 AM, a bulldozer and eight military jeeps arrived in the village of Bruqin close to the city of Nablus. The bulldozer first destroyed a farmers shed, killing the ten rabbits inside. The destruction continued as a caravan belonging to another farmer was also demolished, and finally later the same night, a building belonging to a farmer in the nearby village of Beit Furik was also destroyed. This is just one of many nights where Palestinian property has been demolished by the Israeli army. Inside the village of Bruqin a girl’s school, recently financed by US Aid, is threatened by a demolition order. “I talked to some Israeli settlers one week ago, and told them that we could live in peace, together. But they replied that they want another 700 dunums of land from Bruqin. So, I don’t think that they want peace. If you really want peace, you wouldn’t take what’s mine”. The resistance in Bruqin against the illegal expansion of settlements continues. The day after the demolitions, men, women and children of the village went out on the hills close to a nearby illegal settlement and planted olive trees. Two International Solidarity Movement activists walking on Shudaha Street area were brutally attacked by French Zionist tourists who were visiting to attend the weekly settler tour of the Palestinian part of Hebron. Zionist perpetrator responsible for the attack. At around 1:30 PM the activists were walking in the direction of Shuhada Street when the 6 young men rounded the corner, upon seeing the activists they spread across the road. Within seconds, the group attacked the ISM activists, chasing one back in the direction of the Ibrahim Mosque and continued to attack while soldiers leveled their weapons at the attacker. The other activist was chased, tripped and kicked in the body and face by the Zionist assailant until he was chased away by the two soldiers. On gaining his feet, the activist was punched in the face by the man who had just chased his companion away. The activist ran and the army stopped his pursuer. The incident was reported to the police, who found two of the attackers in Shuhada Street and took their details. They were not detained as it was the Sabbath when religious Jews are rarely arrested. The activists were taken to a local Police station to make a statement and overheard aggressive integration of a Palestinian prisoner. We also received a report that an Italian tourist was attacked by 10 religious Zionists in the city on the same day of the attack. After his beating, was told that if he wants to come back he must wear a Kippah. Hebron, Occupied Palestine – On Sunday, the 16th of February, Israeli soldiers and border police in Hebron fired tear gas and sound grenades at children on their way to school. The border police also chased the children, attempting to arrest them. At Checkpoint 29, around 7:30 a.m., a few children on their way to school (there are three schools near the checkpoint) were throwing stones at the soldiers stationed there. In response to this two border police and a soldier appeared from an alley and threw a sound grenade at the kids close to the United Nations school on Tareq Ben Ziyad Street. This frightened not only the children who had thrown stones but all the children on their way to school, causing them to flee. When they did not catch any children the two border police and the soldier stood in front of the school blocking the entrance and started firing teargas at those who had fled. As the border police and the soldier returned to the checkpoint, three new soldiers came out of an apartment across the street, preventing the children from entering their school. The soldiers continued firing teargas towards the crowd of upset and frightened children. Tear gas is a nondiscriminatory nerve gas which affects all persons nearby. The gas often takes a long time to disperse, forcing children to go through the half-dispersed gas clouds on their way to school, leaving them crying and coughing. The use of tear gas against schoolchildren is common in Hebron. In total, seven soldiers and two border police were involved in the incident, firing six tear gas grenades and two sound grenades at the children. Hebron, Occupied Palestine – On the afternoon of February 11, 2014, settlers in the Tel Rumeida neighborhood of Al-Khalil (Hebron) cut down trees belonging to the Abu Eisheh family. While attempting to film the destruction of the trees, four human rights activists were arrested by Israeli police. At approximately 3:30 p.m., three activists, a Swiss-American, an American, and an Italian, were sitting in their apartment in Tel Rumeida when they heard a commotion outside. Outside the apartment, they found a group of settlers, Palestinians, Israeli soldiers and Israeli police. They were informed by the Palestinians that a group of settlers was cutting down trees at a house just up the road. The three activists began filming but were not allowed up the road to where the tree-cutting was taking place. While filming, the American activist was physically assaulted by a settler. None of the soldiers or police officers present intervened. Instead, the Israeli police took the passports belonging to the American and Swiss-American and told them to sit on the ground. At this time, the Italian citizen returned to the apartment, where she was joined by a fourth activist, an American, who had just arrived. Shortly thereafter, a group of soldiers and police officers attempted to enter the apartment. They were not allowed entry, but briefly questioned the two activists outside the apartment door. The Israeli police then confiscated the passports belonging to the American and the Italian. Not long after, all four activists were transported to the police station near Kiryat Arba, where they were interrogated and threatened with deportation. After seven hours, the activists were released. The following day, February 12th, two activists from Christian Peacemaker Teams visited Tel Rumeida to document the destruction of the trees. They were not there long before several Israeli soldiers approached them, told them to stop filming, and took their passports. They were held for two hours before their passports were returned. Israeli soldiers informed the two activists that if they approached the trees again they would be arrested. The destruction of Palestinian trees by settlers is a chronic problem, not only in Tel Rumeida, but all over the West Bank. 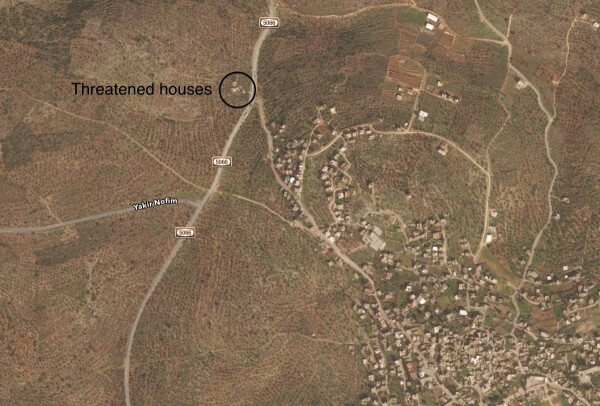 In the past month alone, more than 2500 trees in the village of Sinjil were destroyed by settlers. Trees have also recently been destroyed by settlers in Qusra, Ramallah, and Nablus. Fruit trees are an essential resource for the Palestinian community, and their damage causes serious economic loss. It takes as long as 12 years for an olive tree to reach full maturity.